The DHA+EPA induced reduction in inflammation comes with a decrease in lipid droplet size (O-Red staining from Ferguson 2019), which has been linked to the (ill) metabolic health effects of body fat… it should be said, though, that this will lower the leptin production, a reduction scientists linked to “metabolic damage“. One thing that should make you rethink pounding dozens of cheap fish oil pills (also because it may actually impair your thinking) is the fact that the scientists also observed signs of a “negative impact on myelination and nerve health” in response to the N3 diet – a bad effect on the central nervous system which was only “substantiated by [the] decrease in tissue levels of brain-derived neurotrophic factor (BDNF), as well as decreased expression of synaptic markers (synapsin I & II, synaptophysin, psd95″ (Miller 2019), Miller et al. observed alongside blunted thermogenesis (UCP down) they interpret as further evidence of an effective impairment of the communication between brain and body fat cells. Where to get your N3s from? While fish oil supplements, canned sardines, and salmon have previously been shown to contain similar(-ly high) levels of oxidized lipids as the rodent chow in the study at hand (see Figure 3), tuna in water (or oil), as well as kippered herring tended to have lower MDA levels – at least the products that were tested in the study at hand. 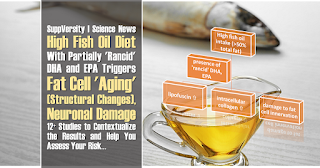 higher levels of lipid oxidation (MDA) at rest and during the recovery period, when the MDA levels were elevated in the fish oil group while they didn’t change in the placebo group. Wang, Yu-Zhu, et al. “Effects of a natural antioxidant, polyphenol-rich rosemary (Rosmarinus officinalis L.) extract, on lipid stability of plant-derived omega-3 fatty-acid rich oil.” LWT-Food Science and Technology 89 (2018): 210-216.